Rolls-Royce (www.roll-royce.com) has signed two contracts with BAE Systems to supply propellers and ‘mission bay’ handling technologies for the Royal Navy’s new Type 26 Global Combat Ship. The contracts cover the initial three ships; the first of these is currently under construction at BAE Systems’ shipyard in Glasgow. 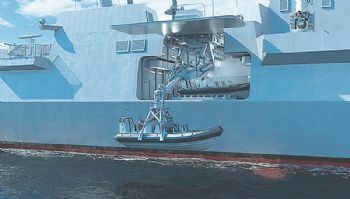 The Type 26 is designed with modularity and flexibility in mind, and a key feature that sets it apart from competing designs is its mission bay handling system; this will allow the efficient movement of craft and containerised ‘mission packages’ within the bay, which also has a launch and recovery capability. Each ship will also feature two Rolls-Royce fixed bolted propellers. Rolls-Royce’s Don Roussinos said: “The Royal Navy’s Type 26 frigates will be globally deployable multi-mission warships capable of undertaking a wide range of roles. Rolls-Royce is delivering the majority of the propulsion system for the Type 26. Power will come from a single MT30 gas turbine (providing direct drive through a gear box), and four MTU Series 4000 diesel generator sets from Rolls-Royce Power Systems.